Is Whitehill Country Park for me? The best way to find out if our park is the right location for your dream holiday home is to come and have a look around, and better still to stay with us! Our Caravans are available between Easter and November and our Lodges, 10th February to 9th January. To make a booking call us on 01803 782338 or book online at whitehill-park.co.uk. Where will my holiday home be sited? All the new holiday homes currently available will be situated in our Orchard View Development. If you choose to purchase one of our sited show homes this will be the final location of your holiday home. You will be able to select a location from our available vacant plots for the holiday home of your choice. Holiday lodges are available for use 11 months of the year (10th February-9th January) with the park facilities available from Easter to the end of October. No. Our Holiday homes are strictly for holiday use only and not as your permanent residence. We are licensed as a holiday park, so you can only use your holiday home for leisure purposes. A permanent residential address, where you pay council tax, must be maintained elsewhere. Proof of this will be required annually. No, you will not own the land. You are purchasing the holiday home with the right to occupy the pitch, as long as all site fees are paid, and the park rules are adhered to. Our pitch agreements are for 40 years, after which time there will be a review. Yes, we are very much a dog-friendly park! Your dog will be welcome in to join you in the Hayloft Bar and you will also find a spacious dog excerise area, woodland trails - and a doggy shower! Will there be any additional costs to maintain my holiday home? Site fees are payable annually. Currently this is set at £4,500 including VAT and rates. Gas, electricity and water are metered and charged at cost. You will also be responsible for the maintenance and upkeep of your holiday home. Our site fees include park maintenance, grounds, maintenance, refuse collection, road maintenance, street lighting and use of facilities and common areas. Our team are also on-site all year round if you require any assistance. Can I let my holiday home? We can offer you the opportunity to let the unit when not in use by you and your family. Please be aware that commission and cleaning charges will apply. See ‘Letting Opportunies' for further details or speak to our sales representitive. Is Whitehill Country Park approved by any trade bodies? Yes. We are members of the BH&HPA (British Holiday & Home Parks Association), are an accredited Premier Park and hold a 4 pennant AA rating. 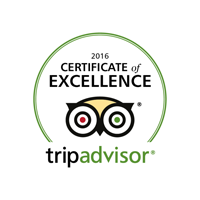 We are also proud to have received the TripAdvisor Certificate of Excellence for the past 5 years.